This vast continent, the only one to stretch from northern temperate to southern temperate climatic zones straddling the equator along the way, is widely believed to be the place of the very origins of mankind. Its fabulous landscapes encompass an abundance of astonishing habitats which are home still to descendants of some of the Africa’s earliest tribes, as well as the tremendous array of fauna for which most of Africa’s visitors make the journey. This continent’s cultural wealth easily matches these natural attractions. Empires rose and fell in Africa thousands of years before the European powers began their protracted exploitation of this continent, and much evidence of this fascinating pre-colonial culture still remains intact. The game parks and wildlife reserves really are only the beginnings of the adventure. In Botswana’s Kalahari desert, you can discover the home to one of Africa’s most extraordinary cultures: the resourceful bushmen demonstrate the most basic and most sophisticated but low-tech aspects of man’s adaptation to his environment and retain traditions of over one thousand years. This is also one of Africa’s optimum safari territories, including the posibility of experiencing a trip through the Okavango Delta in a traditional canoe. Ghana was the seat of the powerful Ashanti empire and the cornerstone of Africa’s gold, slave and ivory trade. The legacy of the colonial years lies with the array of forts along its coast, seemingly built by each country of colonial Europe which was in possession of a navy. In Mali, Timbuktu is the legendary city which also rose up to greatness through trade of its rich natural resources on the banks of the river Niger. 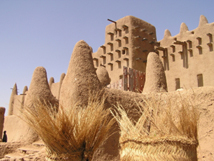 Its cultural wealth is visible in the artful creations of its native people, the Dogon, as well as the indigenous architecture at Djenné, where you can see the world’s largest mud-built structure which is a mosque. In fact, you can participate in its preservation ‘hands-on’ at the annual mud-plastering festival held on site in Djenné, when people come from far and wide in 45 degree heat to lend a hand to re-plastering its majestic walls. Kenya is by far the most popular safari destination in the world, the Masai Mara marking the beginning of the immense serengeti which is known especially for its big cats and thunderous herds of migrating wildebeest. For those who want to safari in style, South Africa too has some top destinations, its most developed parks such as the Kalahari Gemsbrook and Kruger national parks being some of the richest and most accessible. On the other hand, a detour should be made to visit South Africa’s most stunning city, Cape Town, set within a landscape of vineyards and beaches and featuring the extraordinary Table Mountain, a curious backdrop to the colourful and fashionable hub that is the delightful historic centre. Namibia contains the wonderful Etosha National Park, a coastal desert and Kaoko Veld, while off Tanzania’s coast are the lush forests and poetic citadels of Zanzibar, an island which preserves much of its original character as Eastern Africa’s primary gateway and trading post. It is also a mecca for game hunters and wildlife enthusiasts, since the amazing Serengeti and Ngorongoro national parks are home to more game animals than anywhere in the world. Trekkers can rise to the challenge of Mount Kilimanjaro, and then head to Morocco with its four ranges of the magnificent Atlas mountains. Easily accessible from Europe by plane, Marrakech is a haven for hagglers, a vibrant and atmospheric city in which it is recommended to lose oneself in a souk, buy a carpet, eat couscous and enjoy some of the wonderful tours of gardens, palaces and museums.